Antibodies are highly specific, naturally evolved molecules that recognize and eliminate pathogenic and disease antigens. The typical antibody consists of two antigen-binding fragments (Fabs), which are linked via a flexible region (the hinge) to a constant Fc region. This structure comprises two pairs of polypeptide chains, each pair containing a heavy and a light chain of diffrent sizes. The Fc portion of the Ig serves to bind various effector molecules of immune system, as well as molecules that determine the biodistribution of the antibody. Injecting an antigen into mammals (mouse, rat, rabbit, goat, etc). Blood isolated from these animals contains polyclonal antibodies (multiple antibodies that bind to different epitopes of the same antigen), which are purified. Hybridoma technology generating monoclonal antibodies (epitope specific). Specific antibody-secreting lymphocytes are isolated from animals and immortalized by fusing them with a cancer cell line. Monoclonal antibodies are routinely used in biochemistry, molecular biology, medical research and as therapeutic agents. 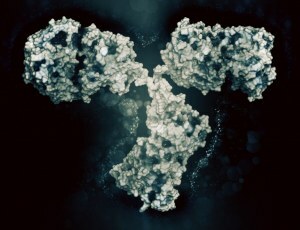 Important advances have been made over the past decade to improve the specificity and efficacy of such antibodies by new engneering technologies, including recombiant antibody technology, such as antibody phage display. Antibodies displaying an agonist or antagonist activity (functional grade antibodies (FuncAbsTM)) are powerful tools for mimicking or blocking physiological functions in vitro and in vivo. Functional grade antibodies are available free of preservatives and tested for low endotoxin content and may be used for activation, neutralizing or blocking studies, both in vitro or in vivo.